It doesn’t matter if you like to tinker in your woodshop, work on cars, do airbrushing, or various projects around the house, there is one tool everyone needs. 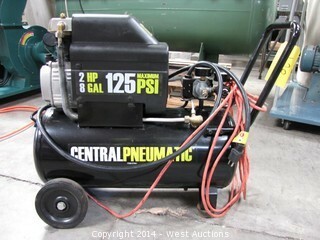 The air compressor should be considered a must-have tool to have in your garage (in most cases). Here are 5 great reasons why you should invest in one. While many of you may still use and even prefer manual tools for projects, there are many jobs where air power is superior. For instance, if you are changing a tire you may want to use an air gun to tighten up the lug nuts quickly. Building a fence? Make it easy on yourself and use a nailgun instead of hammering hundreds of nails. Need to top off the air in your vehicle’s tires? Forget having to go to the gas station to use their compressor or deal with those junky mini compressors you plug in your car’s cigarette lighter. While the use of manual tools is a tradition, the use of air tools can add security to the job. There is less of a chance you are going to lose a tire when tightening with an air impact wrench. The extra force provided by compressed air is like that extra strong hand you always wish you had when using a set of manual tools. The use of hand tools is a traditional method that many mechanics, home, and professionals may rely on to complete a job. However, if you are working against a tight deadline, speed is important. This is where your new compressor can come in handy. An air driven tool can complete a job in mere seconds as opposed to the minutes it would take with a manual tool. Imagine having to build than new shed with nothing more than a hammer and a few boxes of nails? While it’s true that the majority of air compressors need to be plugged into an electrical outlet, how many places where you’d be using it don’t have one? If you are truly in a remote location, such as needing to inflate the tires of your tractor in a field, gas-powered compressors exist to make it possible. These days, most compressors are considered to be portable in some way with attached wheels and a handle. Some compressors are even small enough to fit in the back of your pickup truck or SUV with ease. Obviously, air compressors are useful outside of the garage. After you’re done with your tools for the day, check around the house. Do your kids’ bicycle tires or sports balls need some extra air? Do you have a flat tire on your ATV? What about the tires on your vehicle? Need to quickly dust an area in your garage? As long as you change the tips to the one that fits the job, you can take care of many of the items on your honey-do list in mere minutes. Whether you are a professional or simply a weekend warrior around the house, there are a ton of great reasons to buy an air compressor. It can take the frustration of many jobs, such as painting a large area or working on your car away. When you are shopping keep in mind the types of jobs you’ll need it for and the amount of space you have available. The biggest most powerful compressor is rarely the right one.